Many people like to start the day with a fresh, hot cup of coffee, while others may treat themselves to a daily chocolate bar. Both coffee and chocolate, particularly dark chocolate, contain the mild stimulant caffeine. Caffeine is also found in soda and tea as well as in some prescription and non-prescription medications, such as pain relievers and cold medications. Caffeine has a number of metabolic effects on the body and may increase the heart rate in some instances. Caffeine is a naturally occurring stimulant found in over 60 plants. It is found in tea leaves used to make different teas, coffee beans, cacao pods used to make chocolate and kola nuts used to make some sodas. 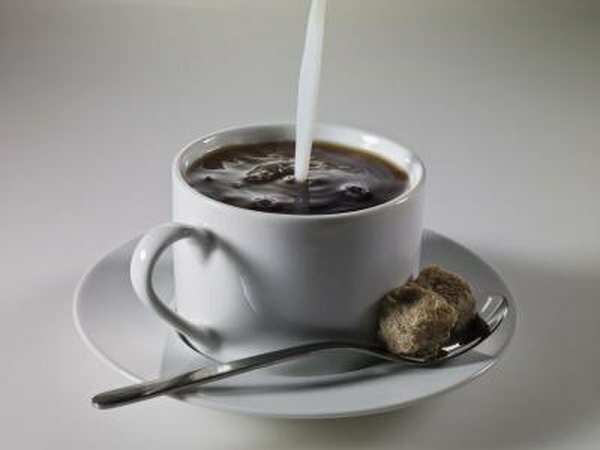 Caffeine can also be man-made and used as an additive in other foods, drinks and medications. Approximately 80 percent of adults in the United States consume caffeine in some form on a daily basis, averaging about 200 mg per day, according to U.S. Food and Drug Administration. The effects of caffeine are typically seen within 15 minutes of ingestion and last up to six hours. Caffeine affects the metabolism in several ways: it causes the release of fatty acids from fat tissue; it affects the kidneys by increasing urine output, which can lead to dehydration. When taken in large amounts, it can affect the heart and circulatory system. Consuming a moderate amount of caffeine daily -- two to four cups of coffee or four 12-oz. caffeinated sodas -- is not thought to be harmful, according to the University of Michigan Health System. However, consuming a large amount of caffeine daily or more than 250 mg of caffeine at a time can cause some unwanted effects. Too much caffeine can act to can speed up the heart rate, which can be dangerous for those with diabetes and heart problems. Those suffering from heart disease should limit their intake of caffeine to avoid experiencing any problems. Caffeine's effects on your heart rate occur indirectly, as a result of its effect on your nervous system. It has a chemical structure similar to adenosine, a chemical naturally found in the brain. Normally adenosine binds to proteins in your brain cells, called adenosine receptors, and this binding has a sedative effect and triggers a feeling of drowsiness. In the presence of caffeine, adenosine can't find to its receptors, so your brain becomes more active. It sends stimulating signals to your body -- including your cardiovascular system -- and these signals trigger an increase in heart rate and blood pressure. Caffeine's stimulant effects means that it poses a health risk to some people. It can negatively affect heart function, causing an abnormal heart rhythm. In some people, ingesting too much caffeine also interferes with sleep, causing insomnia, as well as causing restlessness and irritability. Women who are pregnant or breastfeeding should limit their caffeine intake. Caffeine sensitivity differs from person to person, but generally you should cap your caffeine intake to moderate consumption, or approximately 250 milligrams a day -- the amount in 3 cups of coffee -- according to the University of Maryland Medical Center.